This post is part 3 of the “Customer Development Manifesto” series and makes more sense if you read part 1 and part 2. 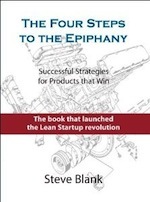 This post describes how following the traditional product development can lead to a “startup death spiral.” In the next posts that follow, I’ll describe how this model’s failures led to the Customer Development Model – offering a new way to approach startup sales and marketing activities. 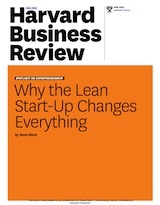 Finally, I’ll write about how Eric Ries and the Lean Startup concept provided the equivalent model for product development activities inside the building and neatly integrates customer and agile development. By the time of first customer ship, if a startup does not understand its market and customers, failure unfolds in a stylized ritual, almost like a Japanese Noh play. Three to six months after first customer ship, if Sales starts missing its numbers, the board gets concerned. The VP of Sales comes to a board meeting, still optimistic, and provides a set of reasonable explanations – “our pipeline looks great, but orders will close next quarter” or “we’ve got lots of traffic to our site, we just need to work on conversion.” The board raises a collective eyebrow. The VP of Sales goes back and exhorts the troops to work harder. To support sales, Marketing tries to “make up a better story,” and the web site and/or product presentation slides start changing (sometimes weekly or even daily). Morale in Sales and Marketing starts to plummet. Meanwhile, if you have a direct sales force smart salespeople realize that the sales strategy and marketing materials the company headquarters provided don’t work. Each starts inventing and testing their own alternatives about how to sell and position the product. They try different customers, different customer contacts, different versions of the presentations, etc. Instead of a Sales team and organized to sell with a consistent and successful sales roadmap generating revenue, it is a disorganized and unhappy organization burning lots of cash. By the next board meeting, the VP of Sales looks down at his shoes and shuffles his feet as he reports that the revenue numbers still aren’t meeting plan. Now the board collectively raises both eyebrows and looks quizzically at the CEO. The VP of Sales, forehead bathed in sweat, leaves the board meeting and has a few heated motivational sessions with the sales team. By the next board meeting, if the sales numbers are still poor, the stench of death is in the air. No one wants to sit next to the VP of Sales. Other company execs are moving their chairs to the other side of the room. Having failed to deliver the numbers, he’s history. Whether it takes three board meetings or a year is irrelevant; the VP of Sales in a startup who does not make the numbers is called an ex-VP of Sales. Now the company is in crisis mode. Not only hasn’t the sales team delivered the sales numbers, but now the CEO is sweating because the company is continuing to burn cash at what now seems like an alarming rate. Why is it only alarming now? Because the company based its headcount and expenses on the expectation that the Sales organization will bring in revenue according to plan. The rest of the organization (product development, marketing, support) has been burning cash, all according to plan, expecting Sales to make its numbers. Without the revenue to match its expenses, the company is in now danger of running out of money. In the next 3-6 months, a new VP of Sales is hired. She quickly comes to the conclusion that the company’s positioning and marketing strategy were incorrect. There isn’t a sales problem, the problem is that marketing just did not understand its customers and how to create demand or position the product. Now the VP of Marketing starts sweating. Since the new VP of Sales was brought on board to “fix” sales, the marketing department has to react and interact with someone who believes that whatever was created earlier in the company was wrong. The new VP of Sales reviews the sales strategy and tactics that did not work and comes up with a new sales plan. She gets a brief honeymoon of a few months from the CEO and the board. Sometimes all it takes is one or two iterations to find the right sales roadmap and marketing positioning that connects a startup with exuberant customers ready to buy. Unfortunately, more often than not, this is just the beginning of an executive death spiral. If changing the sales and marketing execs doesn’t put the company on the right sales trajectory, the investors start talking the “we need the right CEO for this phase” talk. This means the CEO is walking around with an unspoken corporate death sentence. Moreover, since the first CEO was likely to have been one of the founders, the trauma of CEO removal begins. Typically, founding CEOs hold on to the doorframe of their offices as the investors try to pry their fingers off the company. 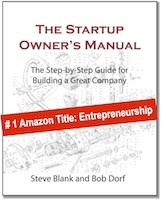 It’s painful to watch and occurs in a majority of startups with first-time CEOs after First Customer Ship. In flush economic times the company may get two or three iterations to fix a failed launch and bad sales numbers. In tougher times investors are tighter with their wallets and make the “tossing good money after bad” calculations with a more frugal eye. A startup might simply not get a next round of funding and have to shut down. Any of this sound familiar? Part 4 of the Customer Development Manifesto to follow. I could imagine a few cartoons enhancing the satire :). Sometimes you go so much ahead with a plan, the mind simply rejects input that would imply that most parts of the plan needs re-work. I think Customer Development (iterative model) helps by putting a strong thought in the mind (at a very early stage) that you could be wrong unless the customer agrees; this helps the mind to be more receptive. One of the subtle lessons here for founder CEOs: you light a fuse on your own job as soon as you hire the first VP of Sales.